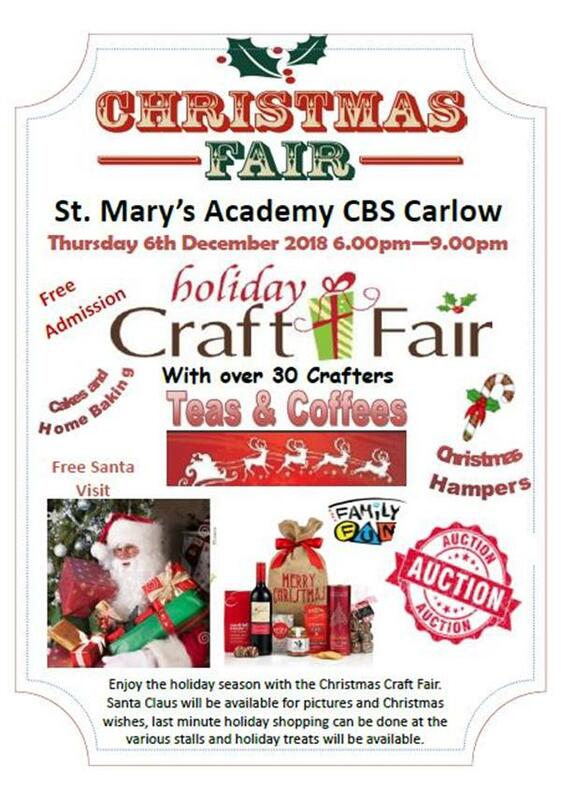 St. Mary’s Academy CBS annual Christmas Fair will take place on Thursday 6th December 2018 from 6.00pm – 9.00pm in the School Sports Hall. With our Parents’ Association providing home baking and a seated refreshment area it is an ideal opportunity to catch up with friends and family over a cuppa and a festive treat. Then stroll through the stalls and view the display of over 30 local crafters together with our TY mini-company offerings. Smell the scents of their products; see the furniture, votive lights, candles, textiles, pottery and more. Take part in the Christmas Hamper raffle, get into the spirit by joining in with our Christmas carollers or just sit for a spell and rest while listening to the wonderful music. Experience a little of Germany when you visit our German market themed stall, hosted by students, serving hot chocolate, lebkuchen and more. Top that all with a free visit to Santa to tell him your wish list and let him judge if you have been naughty or nice! Having recently purchased an adjoining site in the hope to develop into playing pitches this fundraiser is an important event and so everyone is asked to come along and support this fun event.